Participants of Canon PhotoMarathon Malaysia 2018 came together to share their passion for photography and the excitement of the largest ‘live’ photography competition in the country. 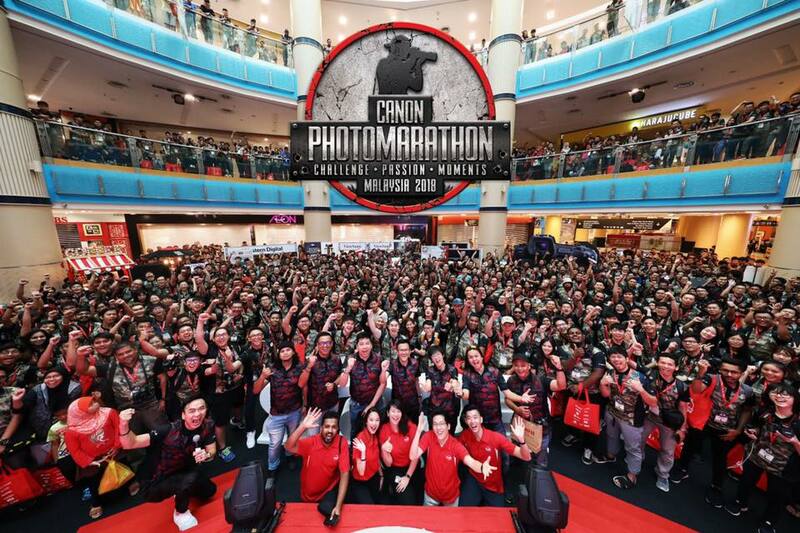 KUALA LUMPUR, 22 OCTOBER 2018 – Canon PhotoMarathon Malaysia 2018 ended on a high note with over a thousand photography enthusiasts from all walks of life coming together for the largest ‘live’ photography competition in the country. In its 12th year running, Canon PhotoMarathon results in an amazing display of photography creativity and skill, successfully demonstrating the best of the community’s passion for photo shooting. The one-day competition challenges participants’ creative boundaries and showcases their skillful techniques in using their cameras - be it a compact, DSLR or mirrorless - to capture photos based on three themes which are only revealed onsite at different times during the day. According to Andrew Koh, President and Chief Executive Officer of Canon Marketing (Malaysia) Sdn. Bhd., Canon PhotoMarathon continues the company’s tradition of cultivating a photography culture and fueling the thriving interest amongst local photography fans by providing them a platform to share their work with a wider audience. “Once again, we welcome the overwhelming response to the competition especially in seeing so many people of differing expertise come forward to showcase their skills. The energy and wealth of creativity is simply amazing; it is testimony to a huge pool of photography talent in Malaysia. This competition also serves to unearth budding photographers and Canon is proud to help develop their photography interest and help them grow their skills to the next level,” said Koh. The judges for this year, Canon EOS Ambassador and travel photographer, Bonnie Yap; chief photographer of the European Pressphoto Agency (EPA) in Malaysia, Fazry Ismail, and award-winning Wedding Portrait Photographers Asia ambassador, Chai Kok Leong, agreed that the competition saw some of the most stunning photos built around the themes of ‘Hidden’, “Beauty of Earth’ and ‘Fragile’. According to Bonnie Yap, “The participants made good use of the venue to reflect their creativity. Many submissions were carefully composed with unique perspectives that portrayed the given themes. “While overall creativity was excellent, we also look at technical aspects of the photos such as focus and attention to details, which separate the best from the good. Also, the varsity Category showed how critical great teamwork is in combining individual skills to produce excellent photos,” added Yap. The grand prize winner (best of show) in the Open Category, 33-year old Mohd Safuan Salahudin from Kedah, with the highest overall score across the three themes, won an all-expenses-paid photography trip to Japan to participate in the Canon PhotoMarathon Asia Championship alongside winners from 12 other countries as well as the newly launched Canon EOS R mirrorless camera. “I am thrilled to have finally achieve my dream of being the Canon PhotoMarathon Malaysia grand prize winner! My journey with photography started at very young age thanks to my grandfather and father who were both enthusiasts too and it is not just my career, but a huge part of my life which allows me to express myself. “I have participated in several Canon PhotoMarathons since 2011 and have won first place in 2016 and 2017 but now I finally will get the chance go to Japan for the regional competition. I look forward to the privilege to learn from Canon’s experts and the chance to exchange knowledge and experience with my peers from around the region,” said Safuan. In the Open Category, Sadiq Asyraf Mohd Yusof emerged victorious as first prize winner, followed by Nursanto Soeradi Somo and Shahrizul Ahmad Shukri in second and third place respectively, while 3 winners walked away with consolation prizes. 18-year-old Darren Lee Tze Huei topped the Student Category while 9-year old Aliyah Zainab binti Asmady and 7-year old Muhammad Adam Mikhael bin Mohd Hafizan came in second and third, respectively. A special prize went to Choon Pang Heong who came out tops in the Partner’s theme bonus Category, which was by Canon PhotoMarathon 2018’s main event partner, Sunway City. In line with Canon’s efforts to inspire and encourage photography interest amongst the younger generation, the Canon PhotoMarathon Malaysia this year featured its first Inter-Varsity Challenge which saw over 90 teams from 20 institutions of higher learning compete in groups of four. Team 1 from Management and Science University comprising Mohd Luqman Alif Bin Mohd Zubir, Aferedolenc Joris @ Satafanus, Mohd Rafiq Redzuan Bin Hamzah and Nurul Ashikin Bt Razali from took home the first prize. Team 1 from University Selangor with members Muhammad Ariff Bin Abu Zarin, Nurul Aiman Binti Mohd Amin, Hadir B. Hadiri and Muhammad Shazwan Bin Shamarul Asrin came in second while Team Harimau from Sunway University comprising John Lee, Lim Jiahao, Niranjini Murugiah and Puteri Iman Alya Ahmad Farizal came in third. At Canon PhotoMarathon 2018, Canon also announced its selection of the first six Canon EOS Youth Ambassadors (EYA) who completed a series of workshops and an apprenticeship under the Canon EOS Ambassadors to qualify. The Canon EOS Youth Ambassador (EYA) programme, which was launched in October 2017, is designed to reach out and encourage photography among a younger generation of Malaysians through a team of their peers. The programme will further develop the skills and talent of the EYAs in their aim to become professional photographers. “In line with our wider efforts to nurture and grow interest in photography, we are proud to select six individuals as the very first Canon EOS Youth Ambassadors who will carry the mantle to tell their stories through their lenses. These six come from very diverse backgrounds who are able to bring to life a wide selection of photography from portraiture to street photography, and from architecture to conceptual art; but most importantly, they are well equipped to inspire a new generation of photographers,” said Jeffrey Kung, Head of Consumer Imaging and Information Group. • and Rhiannon K, a fine art conceptual photographer who enjoys creating surreal conceptual pieces to share her stories. The recruitment for the second edition of the Canon EOS Youth Ambassador programme will be from 20 October 2018 to 30 November 2018 and is open to all Malaysian aged between 15 to 30 years old. Those interested are required to record and upload a 2 to 6-minute video of themselves speaking of their photography experiences and ambitions, why they should be picked for this programme and what they hope to achieve in being an EYA. Participants will need to submit their video URL link and three (3) of their best photography work via email to eosyouth@cmm.canon.com.my by 30 November 2018. The parent company, Canon Inc., has a global network of more than 300 companies and employs close to 200,000 people worldwide. It is dedicated to the advancement in technology and innovation and commits 9% of its total revenue each year to research aZnd development. Canon is ranked first among Japanese companies and consistently one of the top few companies to earn the most number of U.S. patents over the last 12 years. As a Fortune Global 500 company, Canon is guided by its kyosei philosophy that focuses on living and working together for the common good.